If we were to ask you – Does Innovation thrive in India – What would be your answer? While we are not sure about your answer, the recent GE Global Innovation Barometer study points that innovation is happening at healthy pace and over half (56%) of executives who were surveyed believe that Innovation is thriving in India. The study conducted by GE encompassed findings based on 3209 phones interviews conducted with Indian executives between April and May 2014 who were directly involved with their company’s innovation strategy and processes. 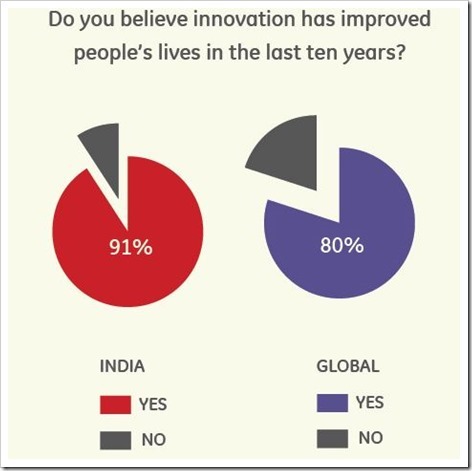 Overwhelming majority (91%) of Indian executives perceived innovation as a positive force and believed that Indians are living better today than they did 10 years ago because of the impact innovation has had. Comparatively, global average was 80 percent. Indian executives felt that Talent, Government intervention and technology are the key drivers for innovation in India. 86% respondents believe combining talents, ideas, insights and resources across the world is the only way to be successfully innovative. Interestingly, contrary to global trends which favor SMEs as the driving force behind innovation (41% feel so), only 31% Indian executives agreed to that. On the other more (33%) felt that multinationals are driving innovation in India. In terms of key innovation challenges, 40% Indian executives felt that scaling to international market was their biggest challenge. Around 30% felt that it is difficult to come up with radical and disruptive ideas. Over 2/3rd of executives in India felt that most successful innovations are planned and arise out of structured innovation process. While only 32% felt that innovations emerge spontaneously. 48% percent believe that it is best to go to market as quickly as possible to stay ahead of the competition while slightly more (52%) feel that rather than rushing with the innovation it good to take time to perfect the innovation before going to market. More Indians (64%) think that use of analytics and predictive knowledge is crucial for innovation compared to 53% globally. The report also stated some very intriguing aspects of Indian executives – Like, around 38 percent of executive have never heard about “Big Data” and 5 percent felt that big data is no more than a buzz word. On the other hand 29% Indians (compared to 25% globaly) felt that they are making most out of the big data. About 40 percent of Indians have also not heard about “Industrial Internet” compared to 44% global average. While 56% Indian executives feel that Indian has developed an innovation conducive environment this year, only about 46% executive from other markets feel the same about India. GE’s Global Innovation Barometer study have come up with lot more findings on innovation in India, and you can check out the complete slideshare presentation below. You can check out the report for last year as well that we had covered on trak.in here.